Jim started his dancing in 1947, His days of calling started a few years later. He is recognized as an outstanding caller and teacher, having been involved in the formation of many Clubs and Caller Organizations. Over the years countless numbers have attended his caller schools, clinics and workshops. Known as a leader of leaders his depth of knowledge about the activity is impressive and he is always available to those who seek his assistance. His organizational leadership has been outstanding as he was involved in the founding of the Tri-State Callers Association and was also a founder and first Secretary of the New England Council of Callers Association where he served in every office. His reputation became known nationally as he became a Charter member of CALLERLAB, the International Association of square dance callers. Jim was their first Chainman in 1975 and served for many years on its Executive Committee and Board of Governors. Jim was inducted into the National Hall of Fame in 1978 and in 1974 received the CALLERLAB Milestone Award. his As I See It” column is a popular monthly feature of the Northeast Square Dancer magazine…and he has called at every New England Square and Round Dance Convention. 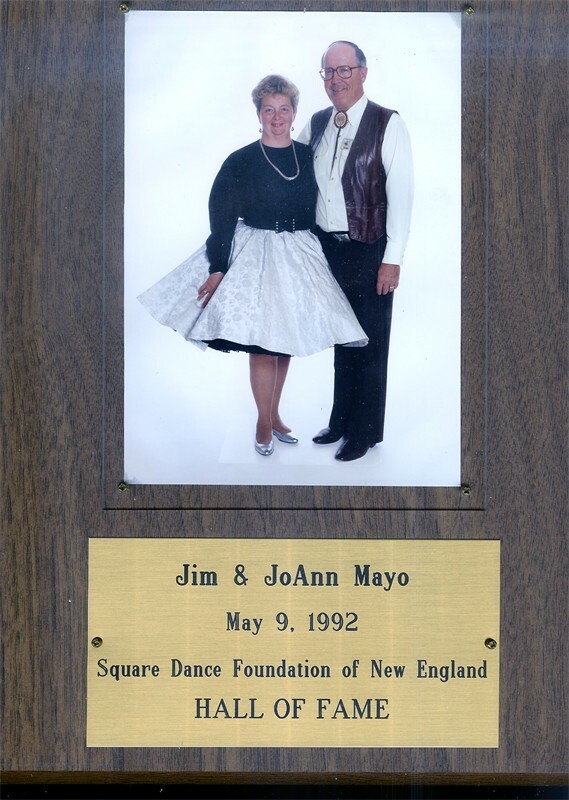 We salute Jim and JoAnn Mayo for all that they have contributed to the activity. We recognize them for their involvement in the perpetuation of the activity and hereby induct them into the New England Hall of Fame.